“With this charming, sardonic debut, stand up comedian and actor Todd Barry makes readers laugh as hard as the audiences at his shows” (Publishers Weekly) in this hilarious book of travel essays from his time on tour in the US, Canada, and Israel. I’d love to tell you more, but I need to go book a flight to Evansville, Indiana. "One of the most truly gifted and skilled wordsmiths and creators in the world of comedy." 5.0 out of 5 starsThank-you for writing this book..
As I was reading this I could actually hear Todds voice in my head telling me these stories with sarcastic, deadpan wit. I love reading about the things that annoyed him & even the simple things like booking hotels & taking a trip to the zoo by himself. This is not a heavy read but a very funny & light read about the working comedian on the road. A must for any Todd Barry fan. Todd has been one of my favorite comedians, and in my opinion, one of the best active comedians, for a very, very long time. 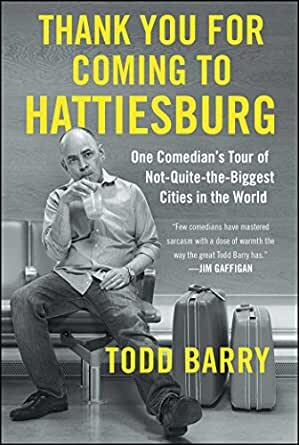 So, when his egregiously titled book "Thank You for Coming to Hattiesburg: One Comedian's Tour of Not-Quite-the-Biggest Cities in the World" came out, I knew I had to read it right away. I was not disappointed. As a fan of his comedy, one can read the entire thing and imagine him telling you the stories in his plodding, deliberate tone, which consequently caused me to laugh out loud on several occasions. If you are a fan of Todd, definitely read this, but there is a lot of meat on the bone for general fans of stand-up comedy or just fans of road diaries (if there is such a thing). A fun read and well-written (as to be expected with Todd's ever-present OCD), which is a nice change from other memoirs of super mega stars (I'm looking at you, Andy Warhol). Todd's humor translates beautifully to the written word. I literally laughed out loud throughout this hilarious book of travel memories. I also learned quite a bit about sky miles, hotel reward points, and what it is really like to travel on the road for your work. Todd's self-deprecating humor--interspersed with his faux boasting--keeps the pages turning and will keep a smile on your face as well. This is a great book, fun to read (or listen to Todd read if you get the audible version like I did), and a great addition to a comedy fan's library. Todd Barry is hilarious on stage, but sadly his book is not. Even though I was disappointed that this book isn't that funny, I'm glad I read it b/c it gives a real insider's view of life as a standup comedian. It chronicles the loneliness of eating alone, the hassles of traveling/staying in crappy hotels, and the constant search for decent restaurants (or coffee shops in Todd's case). I found this aspect interesting, but perhaps a bit repetitive as the chapters seems to overlap and repeat themselves often. If you are looking for a funny book, this is not it. If you are looking for a book that reveals the life of a comedian, this is the perfect book for you. After being late the to the Todd Barry Party (a phrase I just invented), I felt compelled to find out more about this hilarious (new to me) comedian. I saw his most recent special one night and my partner and I laughed so much to the point of tears and I was howling. I am very happy when I find a comedian that makes me cry with laughter. I found this book and had to read it. I found a lot of similarities between me and Todd and while that might not make you buy the book, I think you’ll find this book very funny, honest and candid and above all a glimpse of his exciting life touring the country - sadly I’ll miss him when he comes to my town next week but I’m hoping to see him live soon. Lost track of the times I laughed out loud. I stood next to him once, in the back of the crowd, before he performed at Red Star in Greenpoint as the star special guest of the, now defunct, monthly Pirate Party comedy night. He seemed at ease and laughed along with jokes of the other comedians. Didn't even realize I was next to him until he was announced and walked up to the mic to deliver a hilarious set. I now know it was all for show and he was scanning the venue, sizing us up, listening for jokes to avoid. What was going through his head? Nice, low ceilings if I remember right. Hipster crowd, obviously in Greenpoint, so he could use his big words. I don't think there was a green room, so major points off, and I don't remember the bathroom as all that great and I think it was downstairs, too. It's amazing he was able to deliver as great of a performance as he did! If there's any chance this FAMOUS AS HELL guy gets down and reads his book reviews: Todd, check out "credit card churning". Will really help your travel game.